COMANCHE, Texas – A former national and Super Nationals champion was quick to find suc­cess in a new IMCA division this season. Jeffrey Abbey collected 11 feature wins on the way to earning IMCA Modified national and Razor Chassis South Central Region rookie of the year honors. From Comanche, Texas, and a first-year precision machining student at Texas State Tech­nical College, Abbey earned his first feature win in the division in just his fifth night out as part of a Feb. 18-19 sweep at 281 Speedway. He’d register 24 top five finishes over the course of 49 starts at 10 speedplants, earning Southern Ok­lahoma Speedway and Oklahoma State crowns as well as the rookie prizes. He was runner-up to Josh McGaha in the race for the regional crown. Abbey’s national rookie award is the family’s third: Brothers Steven and Dean topped first-year standings for Southern SportMods in 2009 and the Modifieds in 2014, respectively. 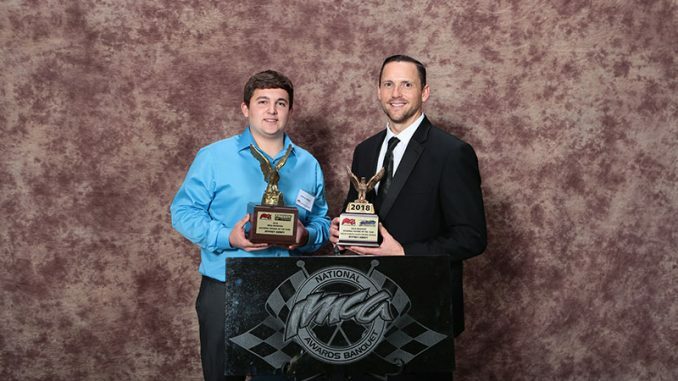 Younger brother Westin was champion of the EQ Cylinder Heads Southern Region for IMCA Sunoco Stock Cars this season. HIS CREW: Father Randy, brothers Dean and Westin, Payton Branch and Robert Scrivner. HIS SPONSORS: Abbey Racing of Comanche; Berta Built Bodies and JL Custom Technology, both of Waco; Abilene Powder Coating of Abilene; 517 Designs of Whitney; Swenson Shocks of San Antonio; Larry Shaw Race Cars of Batesville, Ark. ; Brass Monkey Rac­ing Products of Ada, Okla.; Tumbleweed BarBQue of Stephenville; J & J Motorsports of Haynes­ville, La. ; Dynamic Drivelines of Des Moines, Iowa; and KS Engineering of Albert Lea, Minn.